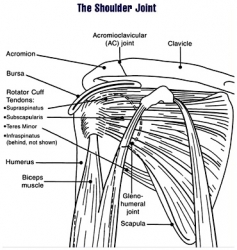 The shoulder (glenohumeral joint) is often a misunderstood joint. Most people believe it is a ball and socket joint like the hip, however it would be more accurately described as a glide joint in a shallow socket. This is to say that the ball on top of the humerus (arm bone) glides around a very shallow socket (kind of like a golf ball on a tee). The mechanics of the joint, unfortunately leave it susceptible to injury, most commonly dislocation. Correctly strengthening the shoulder and in particular the group of muscles in the rotator cuff can go a long way to keeping this joint healthy and fit. The rotator cuff muscles consist of the suprasinatus, infraspinatus, teres minor and subscapularis muscles. Together, these muscles help keep the ball of the humerus in place in the shallow socket. Individually and in combination, they are responsible for internal and external rotation of the arm amongst other less common movements. Keeping these muscles strong and healthy can give any Action Sports athlete a competitive advantage. Setup: For both the Internal Rotation and External Rotation start in an upright position, with a slight bend in your knees. Place your elbow directly against your side and keep the elbow in one spot. Start : in a controlled manner, keep your elbow in place and rotate your arm in, while maintaining a 90 degree angle at your elbow. Finish : Hold the weight briefly and slowly bring it back to the start position while maintaining the 90 degree angle in your arm. Start: in a controlled manner, keep your elbow in place and rotate your arm out, while maintaining a 90 degree angle at your elbow. Finish: Hold the weight briefly and slowly bring it back to the start position while maintaining the 90 degree angle in your arm. Muscles Used: Primarily suprasinatus, infraspinatus, teres minor. Note: When first starting these exercises, you may find that you are very weak. It is important to build strength through technique. In other word, start with light resistance keeping your elbow in place. Only when ready will you add resistance. You can also do this exercise with a resistance band which you can get at any physical therapy clinic.